Which 3D Camcorder is Right for You? If you have a 3D television, then you may also be interested in making your own 3D movies to watch on that TV. Fortunately, many of the major video camera manufacturers (Sony, Fuji, Kodak, etc.) have started making consumer video cameras that can record in 3D. This means that you can record home movies or anything else that you like and have 3D playback for that recorded video. These HD camcorders that record in 3D are both compact and surprisingly affordable for consumers like you and me. Whether you are a professional or a hobbyist, you can start capturing your own 3D video with one of these HD camcorders. One important thing to note is that virtually all 3D camcorders on the market have autostereoscopic LCD screens. This means that you do not have to wear 3D classes to watch your 3D video footage as long as you stay close to the screen. And when weighing the differences between HD image quality, remember that progressive 1080p video renders much more vibrant images than interlaced 1080i HD. The features should be evaluated very carefully because you are choosing how good or how mediocre your resulting footage ends up looking when you watch it for playback on your computer or television. The way that 3D video cameras work is that they use two different lenses to record separate left and right images as you record, with the main difference being in how the images are then processed. With some 3D camcorders, the video is captured by the lenses and then converted to an anaglyph image, which then has to be viewed with those old familiar red and cyan 3D glasses. Other 3D camcorders, typically the ones that are a bit more higher end, can record the 3D video in both AVCHD and MVC (MultiView Coding) formats, which ends up making it easier to create your own 3D videos that can be watched on side-by-side capable 3D TVs. There are even some affordable 3D HD camcorders that shoot video primarily in the normal 2D format but allow you shoot in 3D with an optional lens. This type of camera requires a 3D conversion lens in order to be able to shoot 3D video footage. Recording video footage in 3D is best done in good lighting. It can be very difficult to get 3D video recordings in low lighting situations. You will easily be able to tell if your lighting is adequate while you are filming. You should also note that zooming in too much reduces the 3D effect. So, if you expect to do a lot of zooming with your camera work, be sure to select a camera with high zooming capability for the best results. When looking at 2D video cameras, you will notice that they all pretty much record to solid-state memory. You will likely even see options such as built-in flash memory or high-capacity SD cards. Some cameras even offer a combination of memory recording options. An important thing to note is that these video cameras usually can function as a stand-alone digital camera to take still photos and with some of them, the onboard memory is only for the still camera functions. In such cases, you will still need an SD/SDHC memory card for recording your video footage. Your viewing intentions have a lot to do with which type of 3D camcorder is best for your video recording needs. If you intend to watch the videos with those old school red/cyan 3D glasses, then you just need a cheap 3D camcorder to create anaglyphic videos. To watch the video that you shoot, you just need to connect the 3D camcorder to a 2D HDTV with an HDMI cable or you can use the AV output to watch your video in 3D on an SDTV. Since the video camera records in anaglyph video, all you need is red/cyan glasses to view it in all of its 3D glory. For owners of a 3D HDTV, go with a 3D camcorder that records in either the AVCHD and/or MVC (MP4) format. Since Sony and Panasonic developed the AVCHD video format together, you will likely discover that editing 3D AVCHD video on your computer is a lot easier than the MVC format. However, Sony’s Vegas Pro 11 makes it a bit easier to edit 3D MVC video if you’re using a Sony 3D camcorder. And, the MVC format is the more cutting edge and professional format type. In fact, MVC is the codec used in commercial Blu-ray Discs. Unlike AVCHD, MVC stores two full frames of 1080HD as a single 3D video file. Side by side formats generally have to rely on compromising resolution in order to combine the left and right images from each lens into a single frame. If you plan to upload most of your 3D video footage online, then you may want to look for one of the cameras with the one-touch uploading to the Web feature. However, a camera with an HDMI port is a better choice for someone who plans to watch a lot of 3D video on a fully compatible 3D HDTV. Ultimately, you should choose the 3D camcorder that best meets your needs as a viewer of 3D movies and video. This compact 3D video camera packs a lot of punch for the money. It features dual-HD sensors so that you can record high quality HD video in 3D. You can also take still photographs with this camcorder. It is designed to work seamlessly with most of the 3D televisions that are available for home use. But, you do not have to be near a 3DTV in order to watch your footage. Just playback your 3D recordings instantly on the built-in 3D LCD preview screen without even needing to wear those old school red and blue 3D polarized glasses. Quite possibly the best feature of this camera is its easy to use, one-touch button for high definition recording in 3D. It really cannot be any more simple to use than that. And if you want to take still photos, it is just as easy. Just use the one-touch photo button and start snapping images. To keep with the trend, playback of the footage you recorded or photos that you took is via another one-touch button. As for playback of images and video, it is all easily viewable on the device’s LCD screen. It is a 2.4-inch LCD preview screen. And, as previously mentioned, the 3D-HD camera utilizes Parallax Barrier technology to give you a true 3D video or photo view without the need for any special red-and-blue 3D glasses. No one wants to watch tons of 3D video footage on the device’s small LCD screen, right? Right! Fortunately, this camcorder is compatible with a variety of different devices. This means that you have several options when it comes to watching all that video you recorded on the device. 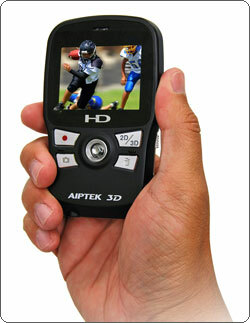 This Aiptek 3D-HD video camera records the 3D video in the MP4 format. This format of video is compatible with most new 3D HDTVs, which means that you can just connect the camera to the TV and watch the footage. Or, if you have NVIDIA 3D Vision technology on your PC or laptop, you can capture, edit, and play back all of your 3D recordings using the state-of-the-art Active Shutter 3D Technology. The video camera comes with some included software that lets you convert your videos to the 3D “Anaglyph” format, which is the classic 3D technology that requires red-and-blue glasses. Once you’ve converted your videos or photos to this format using the software, simply use polarized glasses to view your 3D creations on standard HDTV or computer monitor. So really, you can watch the video on pretty much anything in your home or office. These are not the only features this little camera has to boast about. It’s small and compact size makes it a great choice for taking on the go when you are out with friends or even on vacation. It can easily slide into a pocket with little effort. The camera also includes a built-in HDMI and USB port. This makes it super easy to connect the camera to your home devices. To learn more about this camera and the rest of its features, check out the full specs here.